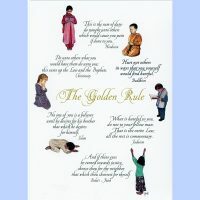 The classic Golden Rule with Praying Children was one of our most popular designs for a decade, but it left out Hinduism, so we replaced it with two other Golden Rule designs. 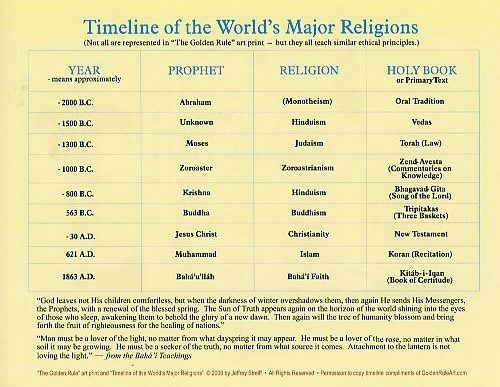 Now it is back with all six of the major religions represented, and an updated timeline on the back. 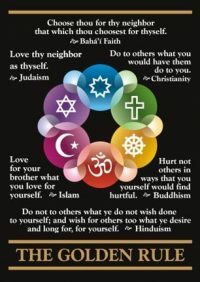 This new version includes a version of the Golden Rule as expressed in the scriptures of – Judaism, Christianity, Islam, Hinduism, Buddhism and the Baha’i Faith. As a poster-pamphlet, it is both beautiful and educational. 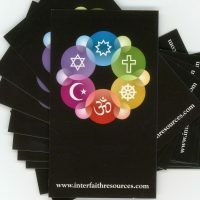 It makes a great gift for comparative religion classes, interfaith gatherings, literature tables and firesides. 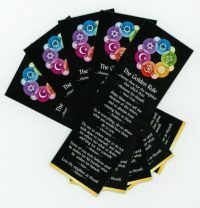 The back has a timeline of world religions that includes the name, year, Prophet and Holy Book for each one. 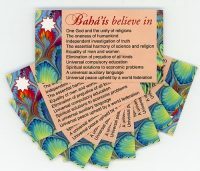 At the bottom is a quotation that says, in part, “Man must be a lover of the light….” and is attributed to the Baha’i Teachings. 8½x11″ on heavy-weight glossy paper.